Iqbal Poultry in Thorne, South Yorkshire has opened a new show plant dedicated to Halal slaughter which has been fitted with BAADER LINCO equipment from Denmark. 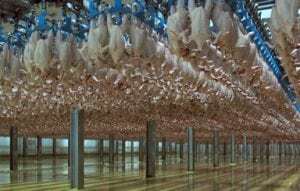 From the outset of the project Iqbal Poultry expressed demand for a live bird handling system that takes animal welfare into consideration, from catching to slaughtering. It begins with UniLoad drawers and modules designed to ensure good animal welfare. The large drawer opening helps the catching operator to place the birds in the drawers without rough treatment. When they arrive the system is designed for controlled conveying of live birds with no dumping or tipping out birds. The shackling operator lifts the birds directly from the drawer reducing bird stress and injuries. To meet the demand for animal welfare and still live up to Halal slaughtering procedures and rules, Iqbal Poultry has installed a High Frequency Stunning System that complies with EU Council Regulations. The poultry factory is designed with hygiene zones and restricted entrance to optimise biosecurity. In addition, several hygiene measures are implemented as part of the processing. 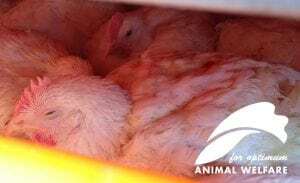 It also includes Clean Air Chill to ensure a fast chilling without freezing the extremities by applying chilled airflow both through the cavity opening and on the bird’s surface. It is a single layer air chilling designed to prevent cross-contamination caused by dripping, and it has a built in system that reduces bacteria in the airflow. The intelligent B’Logic® production management software captures critical information from processing and transforms the information into best fit production, meaning that each bird is carefully chosen for downstream processes according to weight and quality characteristics. Furthermore, real-time upstream corrections to best ensure carcass care throughout slaughtering and evisceration are continuously enabled through the capture of quality grades on the ClassifEYE®. B’Logic® also controls the total bulk pack weigh labelling and finished product dispatch. On the production floor, the packing operator receives clear packing indication supported by intuitive graphics and pictures directly on the touch screen mounted on the packing station. After packing and labelling, the boxes are strapped and a final food safety check is carried out on a metal detector that scans each box before sending it to the dispatch.